I have mixed emotions when it comes to the durability of the Old Skool’s. Based on my experience, and the colourways that I owned, I’ve only had a durability issue with the colourways that have a white outsole. After a few months of owning my black and white colourway, I noticed that the outsole began to get worn down exposing the gum sole. But what really put the nail in the coffin for me, was the unstoppable fading from a pearl white to a dull flat white colour. However, the colourways I’ve had that didn’t have a white outsole I felt have lasted longer. My opinion may be bias to the fact darker colours disguise strains and marks a lot easier but this can play a massive factor when making a decision to purchase. As one colourway could have you back to the store in 6 months time compared to other which could have you back in 12 months. Whenever I see someone wearing the Vans Old Skool, two things always tend to happen. The first being, that I wish I had worn my own pair, me quietly saying to myself “I need to get myself a new pair”. Despite me not finding the Old Skools’ very versatile, the silhouette of the trainer is nothing but tempting and sleek, with its distinct features such as the flat foot design, the suede material on the forefront, the cushioning rubber sole, or it’s most desired feature, the iconic Jazz Stripe. For me, the Vans Old Skool will always have a spot in my stackable sneaker box collection. The price of the Old Skools can vary depending on the colourway or the collaboration, but typically they cost around £57-£60. From one aspect it can be great value for money if you focus on what you can do with the trainer when you think about the appeal and style of the trainer it can definitely persuade any tender individual to purchase a pair at the standard retail rate. But if you consider the number of times you have thought to buy a new pair based on the conditions of the old ones, you may straddle the fence on value. But the true value is in the eye of the beholder, as the feeling you get when you put them on and how they make you feel is priceless. I find the Old Skools not that versatile just based on what I would wear with it. In my opinion, the ideal look I would do is slim fit Jeans, ripped or normal, that just finish above the ankles (my preference), with a simple t-shirt and a subtle bomber jacket. I think this combination really lets the Old Skool really allow to be noticed as a stand-alone piece. I think any other look can be quite risky. 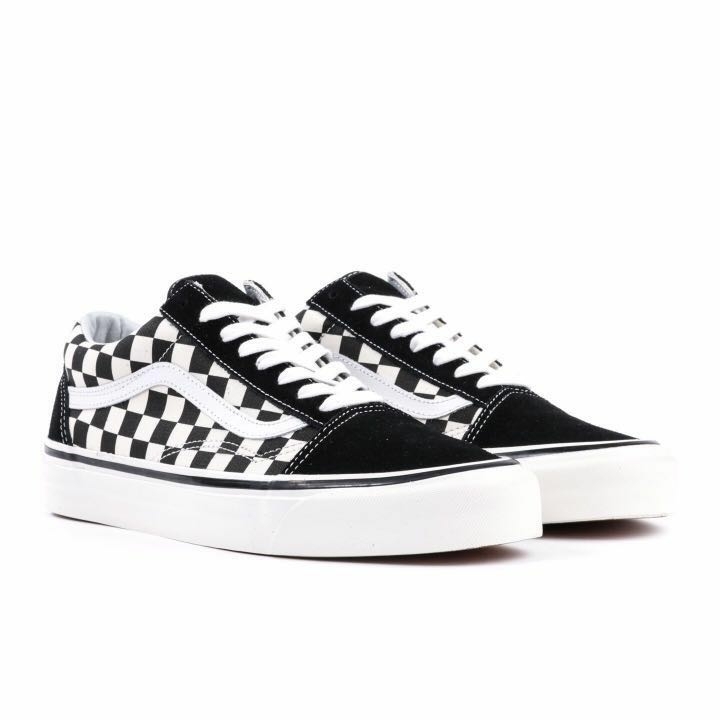 The Vans Old Skool is undoubtedly a real pleasure to wear because they are wide and flat by design, anyone who may find it hard to pick trainers, the Old Skools are where you will find peace. Despite the inner sole of the trainer but being the softest on the market, but over time your feet does mould its own crevasse putting your feet in control of the comfort.